Unfortunately, sun and leather don’t usually mix well. Too much sunlight will do one of two things (and possibly both) to leather furniture and other upholstery– fading and drying. Fading is commonly seen in semi-aniline and aniline leathers, but is a little rarer in fully-finished leathers that have a protective top coat. It’s one of the most common problems we see, and if you put leather furniture next to a window that gets some serious sunlight, you can start to see fading in as little as 4 to 6 months. Drying, on the other hand, is something the sun will do to almost any kind of leather – fully-finished or not. The heat of sunlight causes the moisture in the leather’s natural oils to slowly evaporate, and eventually, it will dry, stiffen and crack. These are both common problems, and no, you don’t have to live with the shades drawn 24/7. There are a few highly effective ways to fight both types of sun damage – it just takes a little preventative maintenance. How do I prevent sun damage to my leather? The best way to prevent drying in fully finished, semi-aniline and aniline leathers (except Nubuck) is by cleaning and protecting them 3 to 4 times a year. Here is a quick tutorial on cleaning and protecting leather. Cleaning and protecting is key, but another good idea is to try your best to keep leather furniture out of direct sunlight. Regardless of how much cleaning and protecting you do, if you put a leather sofa directly in front of a sunny window, you’re asking for trouble. It is helpful to close the blinds during the sunniest, hottest parts of the day. Remember that dark colors absorb more light, and therefore more heat, from the sun. Leather is no exception, so try to avoid putting dark colored leather in direct sunlight if you can. Like we said, fading is mainly a problem that affects analine and semi-analine leathers. The only true way to prevent the fading of leather from sunlight is to keep it out of the sun. Try to place semi-aniline and aniline leather furniture out of direct sunlight whenever possible, and follow the closed blinds tip above if you do have to place these leathers in a sunny spot. If you need to put a piece of leather furniture in direct sunlight, as most people do, we recommend fully-finished leather because of its durability and resistance to fading – so think about where you’re going to put your furniture before you buy if at all possible. Since the leather in your car is likely to be exposed to a lot of sunlight and heat, car manufacturers use leather that is highly resistant to sun damage in their interiors. 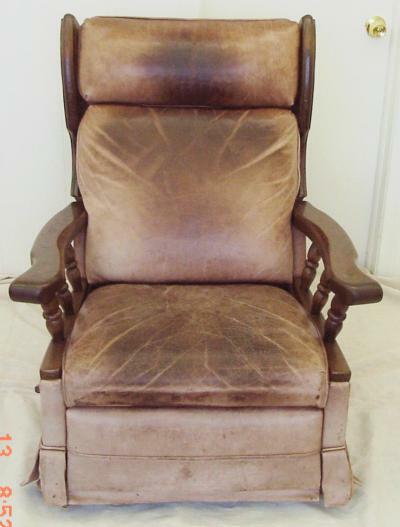 It usually holds up a lot longer in the sun than most furniture leather, but it’s still a good idea to clean and protect it a couple times a year. You can also try using window shields or a sheer curtain to keep some of the light and heat off your leather if you park in the sun for extended periods of time. What if it’s already damaged? What can I do? 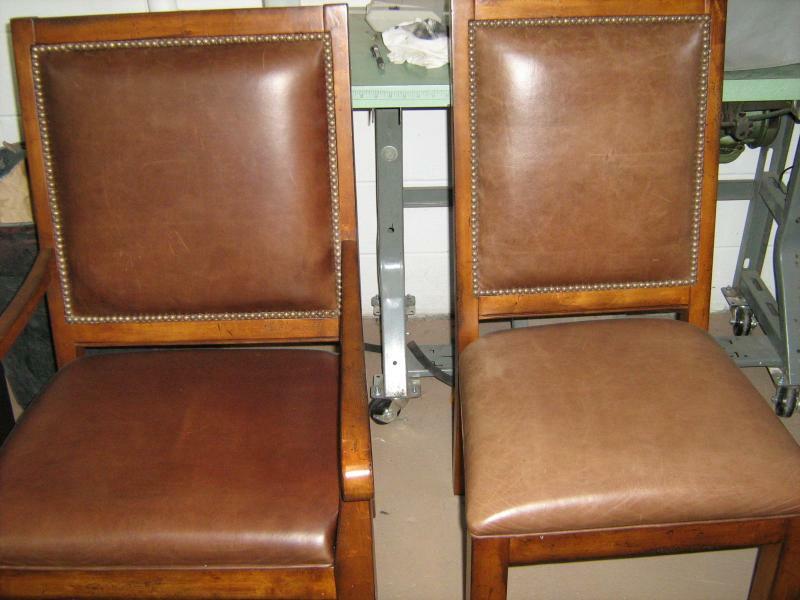 Once leather is faded, the only way to get the color back is to re-dye and color match it, which you’ll need a professional to do. The cost varies depending on the size of the affected area and the extent of the problem. The best way to get an idea of cost is to ask a local professional who can do the work for you. Most pros who know what they are doing will give you an estimate for free –we do at Fibrenew. People always ask us, “Can you re-hydrate leather once it has been dried out?” The simple answer is no; once the natural oils found in leather are gone, they’re gone for good. This is why the cleaning, protecting and preventative maintenance are so important. While it would be incredibly time consuming and impractical for a professional to attempt to re-hydrate dried out leather, your best bet is going to be to patch it, re-dye it and you won’t notice the difference when it’s done. We have seen lots of advice on the internet suggesting that people treat their leather with olive oil to prevent drying. Let me be clear, this is NOT a good idea. Leather is extremely porous by nature, so it will soak up any oils you put on it – and that includes popcorn grease, conditioning oils, body oils and olive oil. The oil gets soaked into the back side of the leather – the part you can’t see. Then, eventually it ends up saturating broader areas as it naturally fills up from back to front over time. Once oil saturates the leather, you end up with oil spots on the surface and a problem that is much harder to solve than dried out leather, like in this photo. We’d be happy to answer any additional questions you have. Please ask in the comments below! If you want to show us a photo of a specific piece of leather, either post it on our Facebook page or contact your local franchisee.